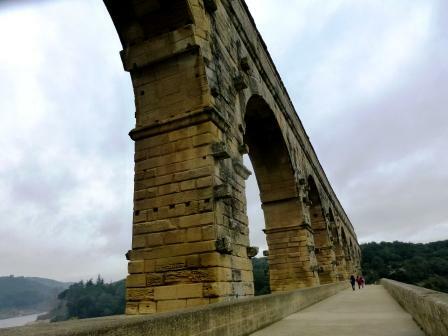 ‘It’ is the Pont du Gard, the tallest surviving aqueduct in the Roman world, a World Heritage Site and one of the key visitor attractions in the Languedoc. 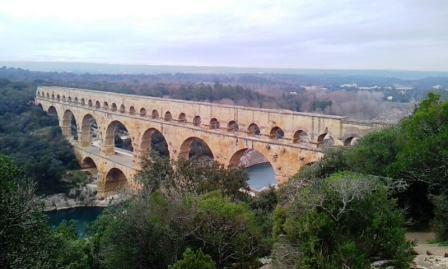 As I was staying in Nîmes , about 20km a way, I took the early morning bus out to the Pont du Gard for a look. Now, apparently, you’re supposed to pay to get in, but when I got there, although the site of the bridge/aqueduct is freely accessible, not another thing was open. No ticket office, no information centre, no shop, no cafe (it was pretty early). Anyway, I decided to have a good wander round the site and then go back to see about buying a ticket and visiting the museum space later. 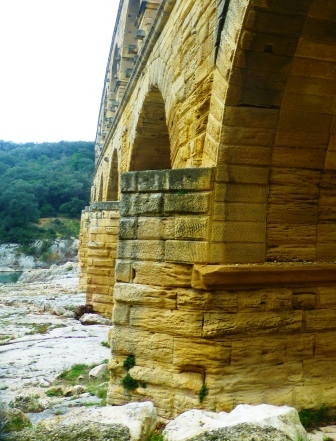 The Pont du Gard forms a part of the ~50km long aqueduct which the Romans built to bring water from the source, the springs of the Fontaine d’Eure near Uzès, to the Roman city of Nemausus, modern Nîmes. 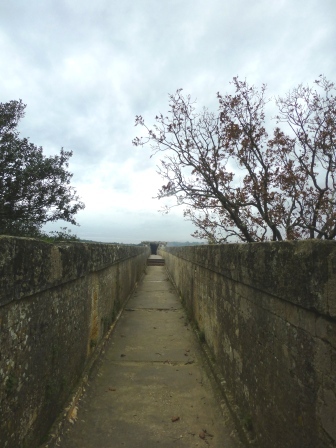 The current structure actually consists of the Roman bridge and aqueduct, built in three tiers with the water channel running along the top tier, and an affixed 18th century road bridge (which is now a footbridge). Taking a proper look at the structure is worth the effort, as it is covered in evidence for its construction, medieval and post-medieval repairs and alterations, and of the later 18th century works. First the Romans. The total height is about 50m, reflecting the height of the steep-sided river valley of the Gardon river. The arches that make up the tiers are unevenly-sized, as the architect seems to have been building the structure as economically (in terms of time and materials) as possible. 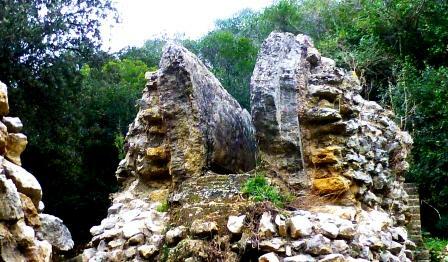 Most of the structure is built in grand appareil, basically big stones, some weighing as much as 6 tons, without mortar. 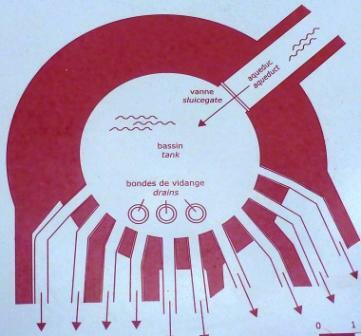 The upper channel for the water (in the images below) was made from petit appareil, small stones, with mortar and lined with ‘malthe’, a waterproof plaster. A lot of the stones are only roughly finished on the faces, possibly to cut down on the workload and so speed up construction. 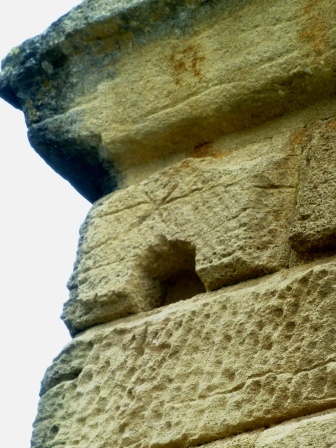 The structure is also peppered with these projecting stones, which were used as supports for scaffolding during construction and repairs. 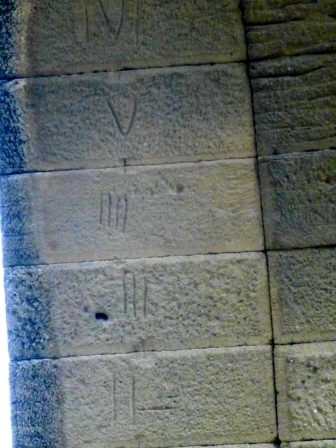 It also has these pointed ‘cutwaters’ on each of the piers of the lowest tier. They work like the prow of a boat and help to protect the piers from the strong currents, especially in the winter. 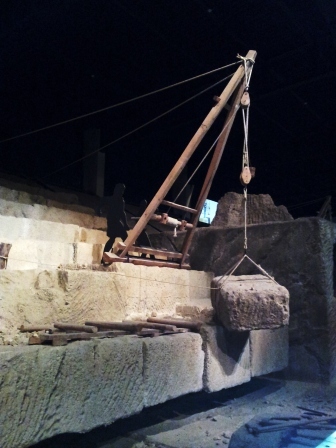 During construction, stone blocks were quarried and roughly finished in the nearby quarries and then brought to the site for assembly. Evidence for elements of pre-fabrication is visible, especially in the voisseurs used to construct the arches on the second tier. 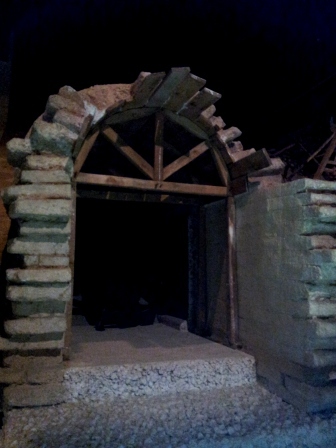 Individual wedge-shaped stones were cut in order to produce the appropriately-sized arch but these then had to be fitted together in the correct sequence on site. So the Roman builders numbered the stones. 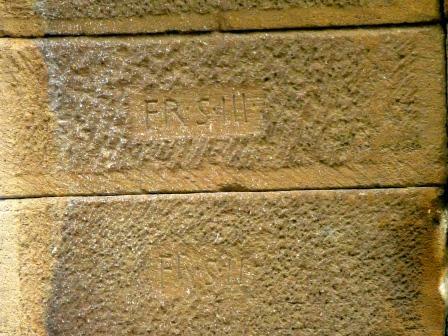 Some with more specific ‘FR’ – ‘Frons’, front; ‘D’ – ‘Dextra’, right; ‘S’ – ‘Sinestra’, left, etc. 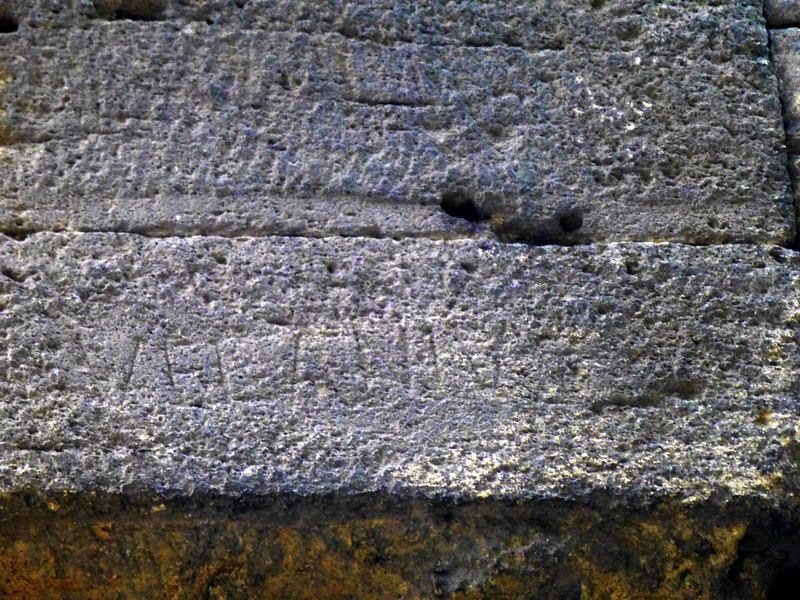 There is also a tantalising grafitti tag on the Pont, the name ‘VERANIUS’. It’s faint, but it’s there. 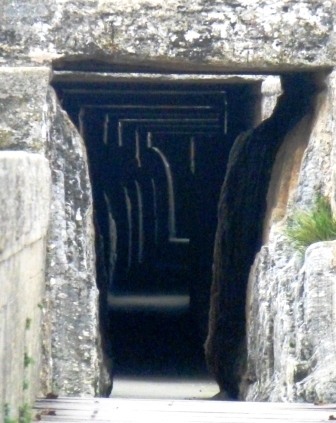 In his guide to the Roman remains of Southern France, James Bromwich wonders whether this could be evidence of a construction worker taking his shot at immortality, or even the name of the architect. 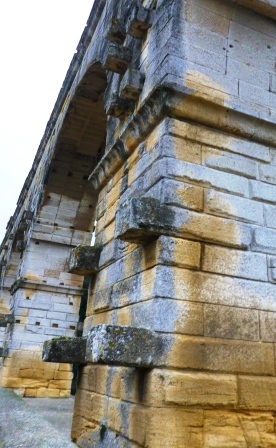 Later repairs can be seen throughout the structure. I can’t date all the individual bits of repair, but some of the stones, especially voisseurs, are clearly newer, even as new as the most recent repairs carried out on the late ’90s/early 00s. 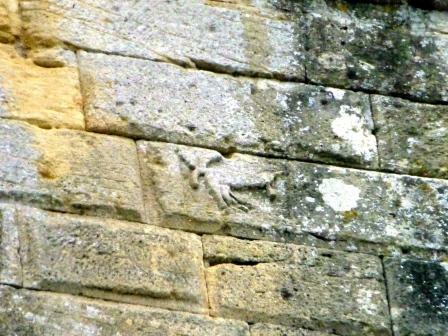 And there is plenty of other evidence for the 18th and 19th century repairs and alterations. 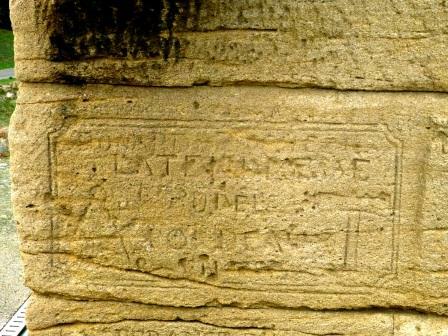 The 18th century section especially is covered in etched graffiti left by masons, showing the tools of their trade; hammers, compasses etc. 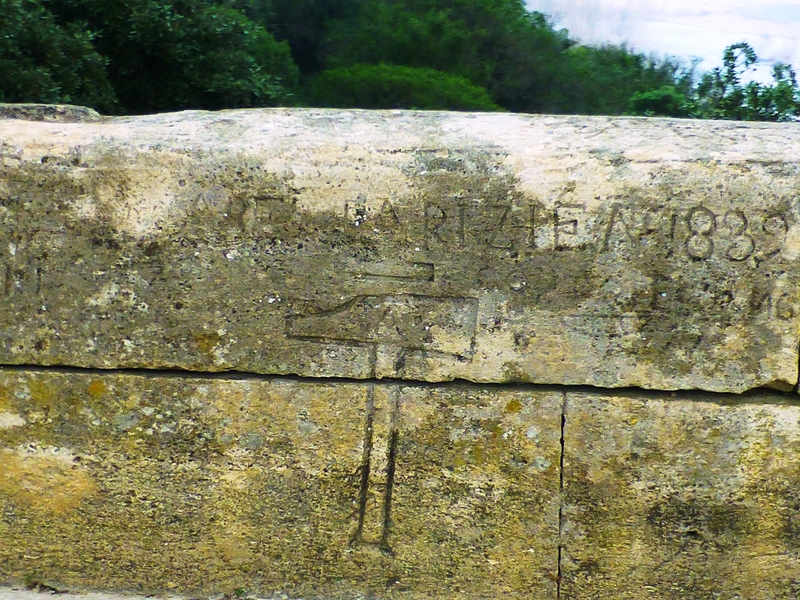 Some of it is quite detailed and ornate (there is also some of this graffiti on the Roman structure). Now I don’t really approve of graffiti, but it can sometimes prove a valuable source of information. Here we see names, dates and information about the guilds of mason who repaired the Roman structure and built the 18th century one. Climbing up the embankment on the east bank, you get this fantastic view. 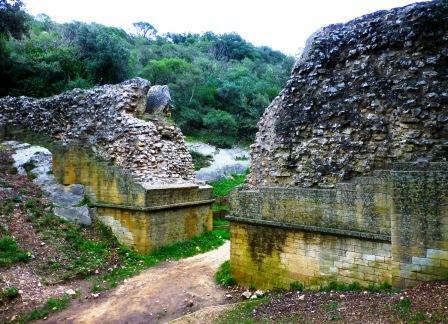 And following the trail along the valley, I came across another chunk of the aqueduct preserved a few hundred metres from the main attraction. And a close-up of the water channel at the top. When I was finally driven back to the museum area by the cold, I tried to buy a ticket from the ticket machine AND the Information Office, but was actually told that I didn’t need a ticket (I’m so confused about this but, hey ho, I tried), so I just went into the museum for a look around. It’s called a museum, but it’s actually more of an exhibition space. there aren’t any real artefacts, but lots of facsimiles and models to demonstrate how the structure was built, its route and how it actually works, some specific features and the history of the site. You could easily spend an hour or so in there as there’s a lot to look at whether you’re interested in construction techniques, hydrology, engineering. Or if you’re interest is in the historical responses to the structure, there’s an excellent collection of drawings and other images, and even the history of the site as a tourist attraction. I had intended to catch the bus to Avignon for the afternoon, but my usual comedy of errors caused me to miss it, so I decided to go back to the Pont to see if I could find some other features that had been eluding me. 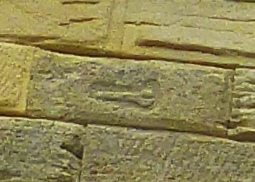 In the centre top of the largest arch is this figure. Ok, it’s a bit tricky to make it out, so here’s the cast from the exhibition centre. 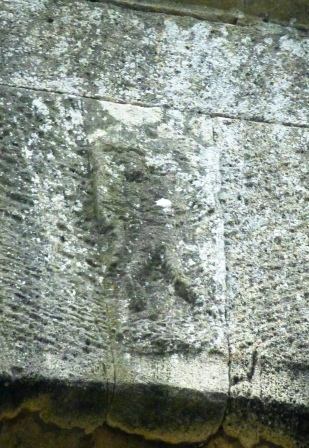 It’s a figure who appears to be carrying out some kind of work. 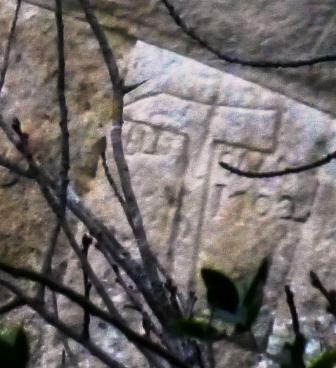 Perhaps a stonemason or quarryman. 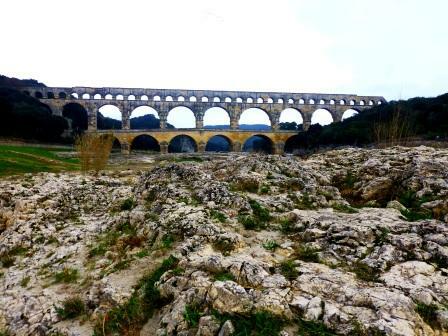 I also managed to spot the ‘Pont du Gard Hare’. Now, any of you who has been hanging out around Romans for any time will twig that this is one of those bizarre phalluses. You know, the ones with wings or noses, chicken legs and small animals riding on their backs. All that malarky. We can giggle and roll our eyes at those funny old Romans but in the past, to spare the ladies’ blushes (? 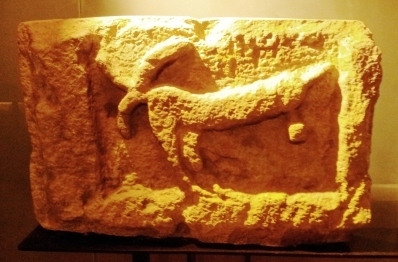 ), it was described as an image of a hare. One Federico Mistral even told of a legend in which a man tricked the devil with the use of this hare. It’s a Roman willy (again, this is the cast from the exhibition). And so is this (even if it does look like a spanner). Well although Avignon would have been nice, I was very glad that I’d stayed. In the end, I had about another 3 hours on site, but even that hardly seemed enough! A second comedy of errors meant that I had to walk to the next town, Remoulins, to catch the last bus back to Nimes, but it all ended well and I would say that this was a very successful trip. I believe that there were more inscriptions that I didn’t get to see, but the site would repay another visit, perhaps in warmer weather. 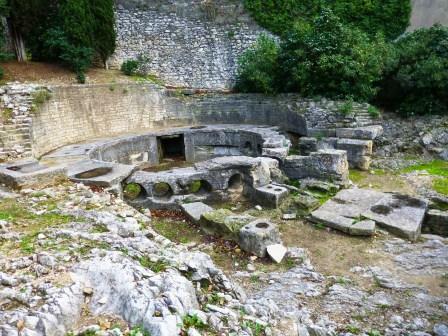 As a little post script, I visited the site in Nîmes where the aqueduct ends. It’s called the Castellum Divisorium and it’s basically a large circular basin into which the water from the aqueduct empties. 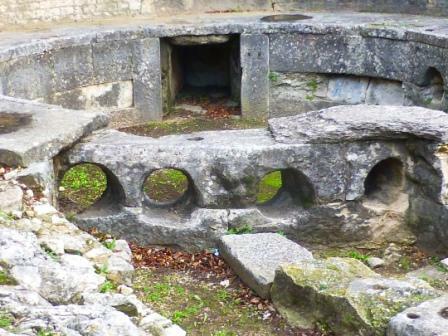 There are holes in the side of the basin where the lead pipes which carried the water to other parts of the city were attached. 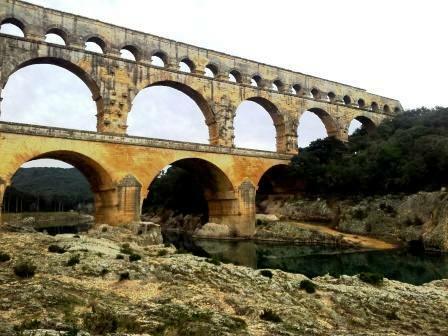 This entry was posted in Archaeology, France, Museums and Exhibitions, Romans, Uncategorized and tagged Archaeology, France, Hydrology, Museum Blogger, River, Roman. Bookmark the permalink. Great photos. I seem to recall that the place charged a fair amount for parking but nothing for admission. Taking the bus was a savvy move, apart from the getting stranded part. And the getting up before dawn part The fee for a carload of people is about e18, so it’s not really that much person. TBH though, it’s well worth the admission fee. I ended up spending the whole day there and still felt like I could have stayed longer. …and actually these pictures aren’t that great. It was such a grey, hazy, drizzly day that I was finding it difficult to get anything really clear, especially with the zoom. But even on a grey, hazy, drizzly day, and even at the crack of dawn, it’s a brilliant site.